This section includes images of the well–preserved Theater and reconstructed Council House (buleuterion) at Patara. The bouleuterion is in the shape of a small theater and could seat about 1,000 people. 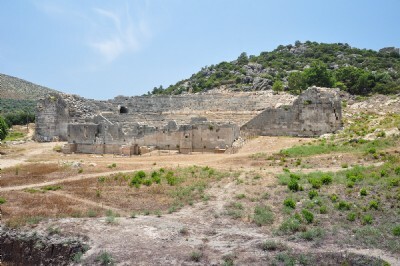 There, not only did the council of the city of Patara meet, but according to ancient sources so did the "Lycian League." The Lycian League was a confederation of 23 cities that were ruled by the assembly that met here. The number of delegates to the Lycian Assembly varied according to the size of the city—from one to three delegates. The larger cities such as Xanthos, Patara, Pinara, Tlos, Myra and Olympos had 3 delegates each. Taxes were also allocated according to city size. The council appointed a one person to govern the league each year and the council appointed judges, etc. The Lycian League is the first known representational governmental system known and influenced Alexander Hamilton and James Madison as the Constitution of the USA was being drawn up. The US House of Representatives is actually modeled on the principle of proportional representation as devised by the Lycian League in the second century B.C. !